These calculators are suggested by the math and science departments for their versatility and durability. 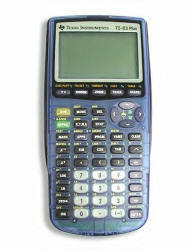 Current versions include TI-83, TI-83Plus, TI-83Silver, TI-84, TI-84Silver and TI-89. With the exception of available memory and installed programs these calculators are all very similar. Read the packages carefully and shop with value in mind. Other TI versions are sold currently, but are not recommended for a variety of reasons. Wabbit Emulator is an on screen TI - calculator that can be downloaded as FreeWare and installed on your computer. These emulators are computer based programs that simulate your calculators. They can be downloaded from several sites including TIcalc.org and must be used with the ROM (Read Only Memory) image of a calculator you own. An emulator is useless without a ROM image, which contains the software you use to operate the calculator. It is illegal to distribute these ROM image files; you must copy the ROM from your calculator using a link cable. Do not ask anyone for ROM images. It is illegal to distribute them. The only way to legally obtain a ROM image is to download it from your own calculator using procedures defined by the creators of the emulator. To link directly to the TIcalc.org ROM page for directions and downloads click here. Students will be trained on and use the calculators that are used by students on the Math portion of the OGT. These calculators will be accessible throughout the year during class and after school. These calculators are not loaned out to students. Forget your calculator and need to finish your homework? This scientific calculator has most of the needed functions. You can download it from its creators by pressing the link above this paragraph or by pressing Download Now. Next time you have your TI at home you should download a TI emulator. The user interface provided by Vernier is a collection of programs contained within a handheld device that will be used to gather, process, graph and analyze data. 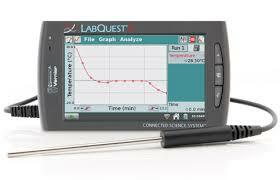 Included are provisions for measuring temperature, transmittance, voltage, current, pH and conductivity and pressure. Data can be displayed continuously or displayed/stored by time or under user control. They can be viewed on smart phones or by any computer on the net. The data is then analyzed using LoggerPro software. The "official" site, with programs for the entire inventory of different calculators and applications. Not a Texas Instruments site, but an "unofficial" calculator site with information about programming, link cables and third party software for them, program archives and more. Send mail to pkirk@fairborn.k12.oh.us with questions or comments about this web site.